위성욱, 석창성, 구재민, 이정민,(2019).소성변형률 에너지밀도를 이용한 In738LC의 고온저주기피로수명 예측.한국정밀공학회지,36(4),401-406. Gas turbine blades are important parts of a power plant, and thus, it is necessary to be able to predict the low-cycle fatigue life of the blades. 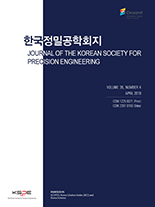 In this study, a low-cycle fatigue test of In738LC, which is used primarily in gas turbine blade manufacture, was performed at various high temperatures (750oC, 800oC, and 850oC). From the test results, the stressstrain curve and the stress-strain hysteresis loop were obtained. It was established that In738LC has no strain hardening or softening. The life prediction equations for low-cycle fatigue were derived using the Coffin-Manson equation and the energy model. In conclusion, one equation for predicting the life low-cycle fatigue was obtained using the energy level with temperature as the varying factor.